Colorado National Monument  is a National Monument in Northwestern Colorado. Denver International Airport , (IATA: DEN, ICAO: KDEN). Commonly referred to as DIA. It is located about 20 miles to the east of downtown Denver. Frontier Airlines, United Airlines, and Southwest Airlines all maintain hubs at the airport in Concourses A, B, and C respectively. Most other major domestic carriers also have service here. Grand Junction Regional Airport , (IATA: GJT, ICAO: KGJT), otherwise known as Walker Field, is served by six airlines with nonstop service to Dallas/Fort Worth, Denver, Salt Lake City, Phoenix, and Las Vegas. Some service is seasonal. For private pilots, it is also possible to fly your small plane into the airport and leave it while you tour the area. Most hotels on Horizon Drive offer shuttle service from the airport. Taxi service is also available at the airport. Interstate 70 runs east-west just north of town. Grand Junction is about 30 minutes east of the Utah border and 4 hours west of Denver. US 50 runs north-south beginning in downtown, running south to Delta and Montrose, then turning east towards Gunnison and Pueblo. US 6 runs east-west parallel to Interstate 70. US 139 runs north south, rejoining I-70 west of Grand Junction, in Loma. US 139 travels north over Douglas Pass to Rangely. Amtrak  serves nearby Grand Junction with the California Zephyr , which runs daily between Emeryville (in the San Francisco Bay Area) and Chicago. For more information, see rail travel in the US. But once at the rail station, you will still have to rent a car. 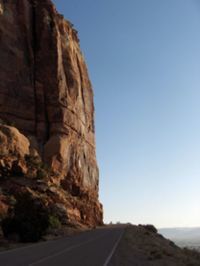 For extreme mountain bikers, it's possible to follow the Kokopelli Trail  from Moab, Utah, then join up with the trail system of the monument. This is a five or six day, strenuous excursion where you must pack in your own food, shelter and water. Saddle Horn Campground near the visitor center has 80 sites. Backcountry camping is also permitted. Colorado's Wine Country - Colorado is home to over 70 wineries and its own indigenous vineyards. Wine lovers can enjoy several scenic day trips from the Monument to many of the small towns that grow their own grapes. These lovely little communities include Montrose, Palisade, Paonia, Delta and Hotchkiss, as well as the city of Grand Junction. 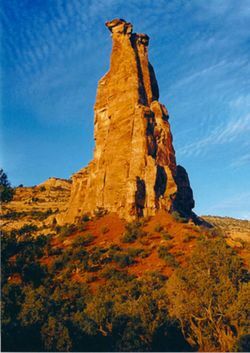 The Monument can also act as the hub for a series of day trips to Telluride, Aspen and Vail, as well as Black Canyon of the Gunnison National Park, Dinosaur National Monument, Canyonlands National Park and Arches National Park. This page was last edited on 18 April 2019, at 13:12.